Kelly-anne films a tutorial video with Sophie Hunter. 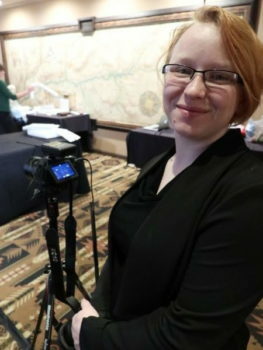 In October of 2017, we, the 2017-2018 DTC Interns – Jeff Braund, Kelly-anne Cubley, and Nicole Schmidt – had the opportunity to travel to New Mexico to the annual Association of Tribal Archives Libraries and Museums (ATALM) conference. The ATALM conference provides a collaborative space for Native and non-Native library, museum, and archive professionals to share ideas, skills, and resources in efforts to support cultural sovereignty. 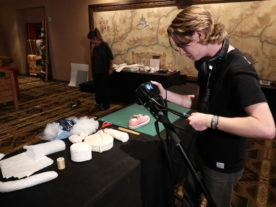 At the conference, we filmed tutorial videos and conference sessions for those who couldn’t attend. 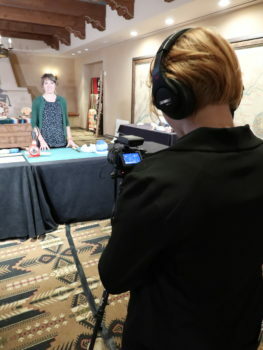 Our video work is now slowly being released on the Sustainable Heritage Network website; one of the grant-funded projects run by DTC Director, Dr. Kim Christen. We were broken up into two teams of two allowing us to film different topics. One team consisted of DTC Assistant Director Ruth Gregory, and Nicole. They spent most of their time filming what were called one-on-ones; short segments of longer speeches or tutorials. The other team was Kelly-anne and Jeff who primarily filmed the larger conference presentations. While on each set, we used skills from which we learned through DTC classes and, also, skills that were taught to us specifically by Ruth. 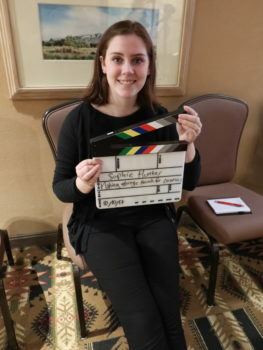 Before we left, Ruth had us filming interviews with DTC faculty and students so we learned how to match our cameras to each other, direct the interview, and learn some basic troubleshooting. We were also able to apply digital cinema theories we learned in classes: like how to adjust the lights to match the color temperature of the room, the rule of thirds, how to record clean audio, and the 180 degree rule. The schedule was fast-paced and breaks tended to be tight; allowing only 15 minutes in between some talks for travel time and set up. Ruth referred to this kind of action as “Hurry Up and Wait,” a phrase meant to denote the nature of quickly getting ready and set in order to anticipate the perfect moment to start filming. We had to always be ready for any malfunctions and quickly adapt along the way so the final product would be what we wanted. While this experience was exhausting, we learned a lot of skills in real time that we would have never otherwise had the chance to learn. It was an incredibly valuable week for us in terms of professional development as we got to apply our multimedia skills in a fast-paced professional environment. We will never forget the experience and will always be grateful for the opportunity to do such a unique and cool thing through our DTC internship.